A salty sea dog with a love for explosions and the high seas. Blast your foes with Plunderbuss for doubloons to upgrade your First Mate's cannon, bait foes with Pretend Pirate, and unleash Man o' War for a fiery finish! 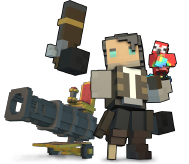 The Pirate's First Mate mans a turret that attacks enemies. Each time First Mate is used, it can be upgraded by picking up Doubloons. Attacking enemies causes them to drop Doubloons, which generate energy and increase the damage of any active First Mate turret. Throws down a booby-trapped decoy that enemies will attack. Summons an extra powerful Man o' War turret which lobs explosive shells that deal damage over a small area.